Madrid offers you the possibility of enjoying a city that is one of the richest in Artistic and Cultural Patrimonial sites, as well as fascinating gastronomy that does not involve compromise. In Madrid, you will find golf courses that have made history, where some of our most noteworthy golf players have reached their greatest successes. This course is located in a natural environment, where you will find the predominant oak, ash and holm-oak trees, with spectacular views of the Escorial Monastery (marvelous architecture character by Old European history). Par 71 is a challenging course where dense oak trees trims the paths and protect the greens in the south section, while the north section is more exposed, and also more demanding. Campo Villa de Madrid is practically situated in the city, and was founded in 1931. It is made up of two courses of 18 holes. The oldest course (Black course) includes a demanding and varied design by Javier Arana, while the most recent one (Yellow course), created by Severiano Ballesteros, is a Par 70 and possess unbeatable views of Madrid, just take for example the views from hole 16 which are the same as those depicted in the famous Goya painting ¨La Pradera de San Isidro¨. Grand competitions have taken place here, such as The Spain Open, The Professional World Cup, The Joy Cup and The Madrid Open, just to name a few. 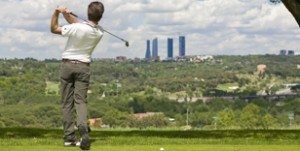 This is a public course also situated within the city, in the modern installations of the Spanish Royal Federation of Golf that also provide accommodation to the central administration of golf and the National School of Golf. This is a comfor table course that will remind you of the typical British design (British Links) as it does not have trees, and is made up of slightly waving fields; though smooth, this course has a high level of difficulty. This club is composed of 4 courses of 18 holes, which were constructed on two different fields on the outskirts of the capital – all of which were designed by Jack Niclaus. The first course (the oldest) is short, narrow, and very technical, while the second is longer, with wider paths and less difficulty. The third and fourth – just recently inaugurated – have been constructed on flat fields with wide paths, lots of bunkers and enormous lakes that guarantee you a varied and attractive game. This is a public course, situated within the city and it is easily accessible, including by public transportation. This course was designed by José Rivero, a winner of the Ryder Cup, who created a course that is extremely comfortable, as it is rather flat, varied and most of all well-appreciated. It consists of one field of 19 holes Par 29, and is simply entertaining! …Ask us for our bestpocket Golf tours, each tour is specifically designed for you, so all details can be tailored to your requirements.